The town of Sumner was named for U. S. Senator Charles S. Sumner, a leader in the anti-slavery movement. 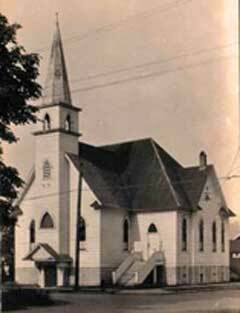 The Christian Church was Sumner's first church of any kind. It was actually a transplant from near Steilacoom area, moving here in 1863. Early members included J. R. Meeker, Abrial Morrison, Sherwood Bonney and Israel and Thomas Wright and, of course, their families. Their earliest meeting place is unknown, but by 1872 they were meeting in a schoolhouse in the corner of Main Street and Wood Avenue. Mr. and Mrs. George H. Ryan were baptized and united with the church in 1879. 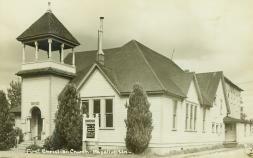 Four years later, when the church had 80 members, the pictured building was built on the NE corner of Alder and Maple. This served the church until the 1950s. The roof lines suggest that space was added after the original building was constructed and this agrees with a map dated from 1899 that shows just one ridge line. Sumner, Jan. 19. -- We built a nice meeting-house last year, 28 by 48 with two rooms back of the pulpit and a baptistery, the whole costing about $2,500. Meet every Lord's day to break bread. Preaching every Lord's day by Bro. Wolverton. . . . The 1884 building was located on the northwest corner of Maple and Alder and had a shed on the back of the small property. Soon, a second section was added that paralleled Alder Street and that is the building shown in the photo. The structure was later raised, a basement added and the main floor expanded. Sherwood Bonney and Lydia Ann (Wright) Bonney crossed the plains with ox teams in 1852. Mrs. Bonney taught school in Steelacoom in 1854. Sherwood was Justice of the Peace for Pierce County that year. He remained with the Sumner Church until his death in 1908 and is buried in the Sumner Pioneer Cemetery. Another prominent family was that of Reuben M. and Sarah E. Baker. Their daughter Flora married the son of Neal Cheetham, who preached in Washington for many years as well as becoming State Auditor and serving in the Legislature. The Bakers are buried in the Sumner Cemetery. In 1883, the elders were George H. Ryan and Dr. Charles Spinning. In 1890, Henry Cogswell was preaching here. Dr. and Mrs. Spinning were widely known and loved. He served as physician to three Indian tribes, his territory extended from Vancouver, Washington to Vancouver, B. C. Mrs. Spinning was a wonderful woman. She used to assist her husband when he brought a new baby into the world. One admirer of Mrs. Spinning tells how, when she was immersed into Christ, Mrs. Spinning, helping her dress, reminded her that she had dressed her when she was born. On Sept. 16 we thought it would be profitable to give a lecture commemorative of the birth of Alexander Campbell one hundred years ago, Sept. 12, detailing his life and work from his childhood to his death, together with those changes which came over him making him the reformer he afterward became. As many persons are unacquainted with the history of Mr. Campbell, we thought we could improve this occasion to the profit of all. Had a large audience of interested hearers. . . .
After the morning sermon a lady who had been brought up a Quaker came forward, made her confession and was immersed. In the years following 1900, Orlo J. Law of Missouri moved to Sumner to be the minister. We have a handbill of Mr. Law from the days he held nightly gospel meetings. Pioneer Reminders: Bonney Lakes are named for Sherwood Bonney. In 1878 the first members of the Christian church began to arrive in Tacoma, but it was not until 1882 that the first preaching services were held. These were conducted in the Burns schoolhouse, and in 1883 Bruce Wolverton began preaching semimonthly. March 2, 1884, saw the formal organization of the church with twenty-four charter members. The first meeting place for the new church was in a dingy room over a shop owned by A. S. Black, but in 1886 a small church building was erected at 1305 South E Street. The building was dedicated on August l. In 1895 an addition was made to this building. On September 10, 1906, ground was broken for a new church building at South Sixth Avenue and K Street. Early in 1887, A. M. Sweeney was the preacher. It was about June 6, 1887 when Keys H. Sickafoose began preaching for the group in Tacoma. He wrote one year later, "The work here is prospering and we are having additions almost every Lord's Day." During the summer of 1889, Mr. Sickafoose moved to Salem and M. F. Redlein took up the work in Tacoma. The membership that summer was 178 souls. In earlier literature, this town was named Carbon. However, there is another town named Carbondale in the area, so it was renamed to Orting, an Indian word meaning prairie village. In April I held a twelve-day meeting at Orting, a new town eighteen miles up the railroad from here. Organized with sixteen members. Money has been raised to build a house there and they have secured a lot and are at work. They have their house so they can use it. It is all paid for except $50. They want me to hold a meeting next month, which I will do if I can. The church property was on Varner Avenue SE, exactly half way between Calistoga Avenue and Train. It was on the side that was more to the north. By 1891, John A. Sidener was writing the reports from Orting and we assume that he was the preacher. This Pierce County community took a local Indian name that translates "generous people." In June, 1905, L. F. Stephens, Washington state evangelist, came to Puyallup for the purpose of building the church. He asked for four carpenters to assist him and promised to have the building completed in four weeks. The only other requirements were a place to sleep and enough to eat. The four carpenters were obtained, and the church was built. 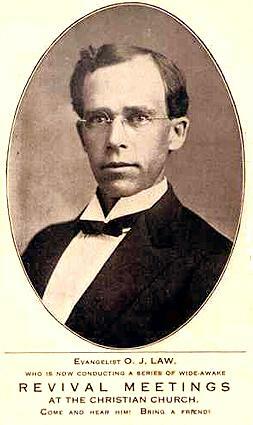 J. T. Eshelman became the first pastor. S. W. Clascock came from Missouri to be the preacher on April 1, 1894. Among his first activities was to hold a night-to-night meeting at Sumner with 22 additions. Our photo at right comes from a later era, but the original building is probably wrapped inside of the one pictured. It was common in that time for an architect to add to an existing building and the earlier one can be detected by looking at the roof lines. The building was located on the east side of Meridian between East Pioneer Avenue and 4th Avenue SE.